The South German Coldblood (German: Süddeutsches Kaltblut) is a breed of draught horse from southern Germany. It is distributed mainly in Bavaria. 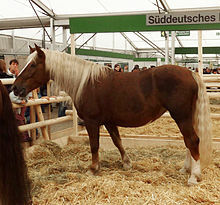 It is the most numerous of the four principal German draught horse breeds – the others being the Black Forest Horse, the Rhenish German Coldblood and the Schleswig Coldblood – and is the only one not listed as endangered by the FAO or by the Gesellschaft zur Erhaltung alter und gefährdeter Haustierrassen, the German national association for the conservation of historic and endangered domestic animal breeds. The South German Coldblood shares common origins with the Noriker breed of Austria, and the two breeds are sometimes considered an entity. However, genetic analysis has shown it to be not only quite distant from the other German draught breeds, but also to be clearly distinguishable from the Salzburg and Carinthian Noriker populations. The differences may be attributable to Thoroughbred and warmblood influences on the South German Coldblood. In 1906 a stud book was established for horses of Noriker type in the Bayerisches Oberland [de], the upland region of central southern Bavaria that borders with modern Austria. From 1920 breeding came under Bavarian state control at the former State Stud of Schwaiganger at Ohlstadt; the stud book was closed, and an edelweiss symbol was adopted as a brand. At this time the lighter type of Noriker horse was known in Bavaria as the Oberländer, and the heavier type was called, as in Austria, the Pinzgauer; this distinction was dropped in 1939, and the name Noriker applied to all. In 1948 the present name, Süddeutsches Kaltblut, was adopted. The breeding population has remained relatively stable since 1997, when it was 2113. In 2013 it was reported as 1921 mares and 129 stallions, totalling 2050. Like the Noriker, the South German Coldblood is one of the few horse breeds to sometimes display leopard or "tiger" spotting. The South German Coldblood is particularly susceptible to the bone diseases osteochondrosis and osteochondritis dissecans. A study of 167 young horses averaging 14 months old found osteochondritic lesions in the fetlock or hock joints of 61.7% of the sample, and osseous fragments in 28.9%. The incidence in fillies was double that in colts, and symptoms were more often seen in horses a year or more old. Three single nucleotide polymorphisms associated with osteochondritis dissecans in fetlock joints have been identified. Wikimedia Commons has media related to Süddeutsches Kaltblut. ^ a b c d Süddeutsches Kaltblut (in German). Pferdezuchtverband Baden-Württemberg e. V. Accessed October 2014. ^ a b c d Breed data sheet: Süddeutsches Kaltblut/Germany. Domestic Animal Diversity Information System of the Food and Agriculture Organization of the United Nations. Accessed October 2014. ^ Barbara Rischkowsky, D. Pilling (eds.) (2007). List of breeds documented in the Global Databank for Animal Genetic Resources, annex to The State of the World's Animal Genetic Resources for Food and Agriculture. Rome: Food and Agriculture Organization of the United Nations. ISBN 9789251057629. Accessed October 2014. ^ K. Aberle, J. Wrede, O. Distl (2003). Analyse der Populationsstruktur des Süddeutschen Kaltbluts in Bayern = Analysis of the population structure of the South German Coldblood in Bavaria (in German). Berliner und Munchener tierarztliche Wochenschrift 117 (1-2): 57-62. ^ K. Aberle, H. Hamann, C. Drögemüller, O. Distl (2004). Conservation of genetic diversity in German draught horse breeds using DNA markers (session G3.14). Proceedings of the annual meeting of the EAAP, University of Veterinary Medicine Hannover: Institute for Animal Breeding & Genetics. Archived 27 October 2014. ^ Rassebeschreibung Pferd: Süddeutsches Kaltblut (in German). Zentrale Dokumentation Tiergenetischer Ressourcen in Deutschland (TGRDEU). Accessed October 2014. ^ C. Wittwer, H. Hamann, E. Rosenberger, O. Distl (2006). Prevalence of osteochondrosis in the limb joints of South German Coldblood horses. Journal of Veterinary Medicine, Series A 53 (10): 531-539.